Foxes usually rip the heads off chickens and will kill as many birds as they can in a frenzy if they manage to get into a run or coop. Foxes usually get into a run by digging and squeezing under a fence or by going over the top of a fence. Fences need to be buried at least 8 inches deep with the wire then curled flat outwards by another 8 inches. They can clear a 5 foot fence with ease. Remember foxes are more like cats than dogs and can jump! Foxes can also tear rabbit wire fences with their teeth – it is best to keep fences taught and ideally use the I inch rectangular wire as this is thicker, stronger and they can’t get their teeth into it. They will squeeze through the smallest of gaps… but don’t take my word for it, this short clip shows him in action! 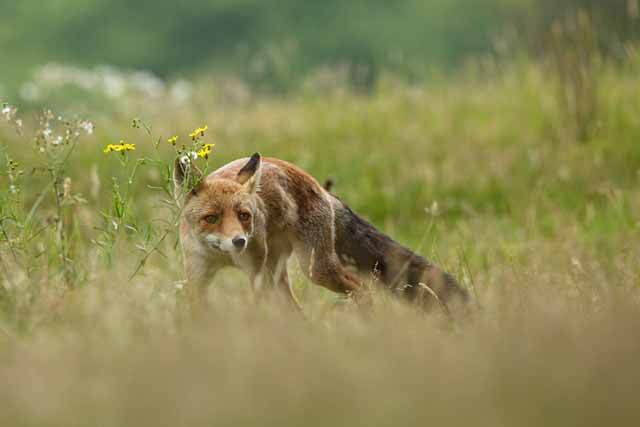 Foxes usually work alone but towards the end of summer, sometimes the Vixen will hunt with her cubs to teach them. When are your chickens at risk? Foxes are generally nocturnal creatures, hunting under the cover of darkness; however when there is a large population of foxes or a shortage of food as is often found in the urban environment, they can start to become a pest during the daytime. Young cubs that are just finding their own food often stay out until mid morning, I frequently see them playing on the bales of hay in the fields near my home in late June and July and from time to time they will come into my garden. The winter is obviously a dangerous time for chickens when food is short, however the time when most of us get caught out is June to August. Cubs are learning to hunt on their own, will often come early evening or morning when it is light and don’t have the fear to stay away from us. If your chickens free range, a fox may make a dash, grab a chicken and run off. During these risky times, you may need a small secure run to house them when you are out but there are other options. Electrified poultry netting works wonders at keeping them safe in a large area and you may be able to speak to your local game keeper if you have a problem fox that is very determined. Do you have any advice on Foxes? Please leave a comment below if you do. I let my chicken run free range in my city garden, but this morning a fox came visited. Luckily it got caught up in the fence so gave me time to put the chickens away. My chickens love going free range, and crow (although hens!) when I keep them in the run, annoying my neighbours. Now the fox knows they are there, does this mean they cant be free anymore? He is sure to come back…. they always do. 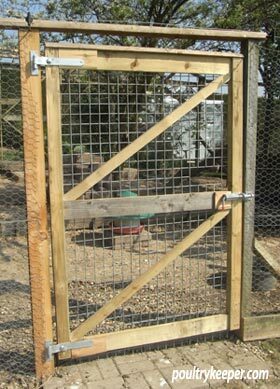 Could you use an electric fence to make an area secure? I have large run with 6 foot wire fence that is,as far as I can see, secure. we have a large tree in the run and a tractor tyre cemented into the ground under the tree. At least 5 of my chickens roosted in the tree but would return to the run during the day. I was out all day Monday and so did not check the chickens until Tuesday lunchtime. There were none in the run, No feathers, no blood, no signs of attack, no corpses. The run door was closed and 1 chicken was outside the run (she has now gone back in). I did have 7 hens 2 cockerels and 1 small chick (about 3 week old), all have gone, except the one hen. Does this sound like fox attack? I have been told it could be mink but from what I see they leave corpses. Yes, most likely a fox. They will normally carry them off and bury some for eating later on. Look for areas of soft soil locally, sometimes you’ll find an odd feather. The fox will always come back, so make sure any survivors are kept safe. 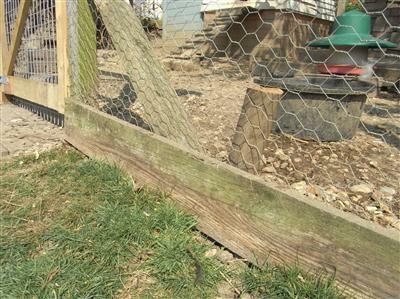 One of my bantams got stolen by a fox in December, it scratched up the side ,pushed/bit/clawed apart the wire joins and picked her out with its paw. She was sleeping on a ledge next to the side of the run, inside the run. I admit this was certainly a wrong doing I’ll never repeat. Now I always put them into bed in their coop so they are out of sight. All there was was a handful of feathers and a fox poo behind my allotment where it had made its escape. The one next to her got pawed on the back and I had her at home for 9 days. She has now recovered. The third chicken was asleep inside her coop and never knew about a thing. I suppose I am lucky it didn’t actually get in. I tend to think it was a mother feeding its cubs as it has been so mild it may have had a second lot, or maybe it was a cub but the paw prints were quite large like dogs. I now put the two to bed in the coop, have barb wire and double wired the run all over. I’ve filled in gaps all around my allotment and its irritating to think that my small tiny bantam (1 of 3) got taken and people have 20-30 up there-not that I would wish it one anyone. I’m still worried the fox will come back, whether it thinks it killed them all or not. How can I move forward? I am looking into electric fencing but I don’t have power up there. I did think about relocating my plot further into the site (starting again) but no doubt that fox knows the allotments like the back of its hand, and where all the chickens are. Any help appreciated and I’m glad I’ve found your website its really helpful. Electric fence energisers come in 12V versions as well. I use one for my sheep and charge the leisure / caravan battery (car batteries aren’t good for this) every 2-3 weeks. It depends on the size of the battery and the energiser of course. It you buy a really big unit, it will need more power.